This expansion board as a driver expansion board, can be used for engraving machines, 3D printers. It is a total of four slots, can drive four A4988 stepper motor. Each road stepper motors only need two IO ports. In other words, six IO ports can be well managed three stepper motors. Very convenient to use. UNO for Arduino module IO port correspondence introduction. / / Function : step . 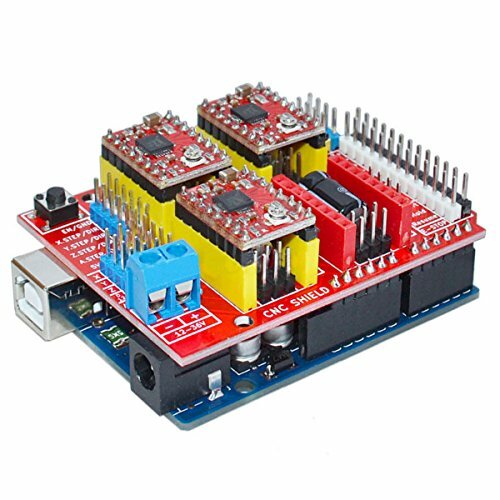 function: to control the direction of the stepper motor , the number of steps . Feature: This expansion board as a driver expansion board, can be used for engraving machines, 3D printers. It is a total of four slots, can drive four A4988 stepper motor. Each road stepper motors only need two IO ports. In other words, six IO ports can be well managed three stepper motors. Very convenient to use. UNO for Arduino module IO port correspondence introduction. View More In Printer Developers. If you have any questions about this product by BephaMart, contact us by completing and submitting the form below. If you are looking for a specif part number, please include it with your message.